The compact Pioneer DDJ-800 is an ultra-portable controller for rekordbox dj that offers two microphone inputs. It’s also the first all-in-one DJ controller to offer an onboard feedback reducer. When you’re using microphones with the DDJ-800, rekordbox dj’s Feedback Reducer function detects which frequency is causing the feedback and automatically helps correct it. This lets you DJ and emcee with confidence at weddings, parties and other events. If you’re doing a DJ gig at high volume levels, it can be hectic juggling music, an emcee and guest speakers. The last thing you want to deal with is feedback. This controller lets you focus on being in the moment and creating the right vibe on the dance floor. With so many features and such a small, portable form factor, this 2-channel controller makes it simple to take the party on the road. The DDJ-800 is an especially lightweight DJ controller. It’s based on the Pioneer DDJ-1000, but has a smaller footprint. The DDJ-800 inherits all the high-tech features that made its larger sibling so popular. Even though it’s smaller and more portable, the DDJ-800 still delivers the goods, such as color on-jog displays. All the critical information you need while mixing is at your fingertips in full color—right in the center of each jog wheel. Waveforms, BPM, playing time and more are all displayed. 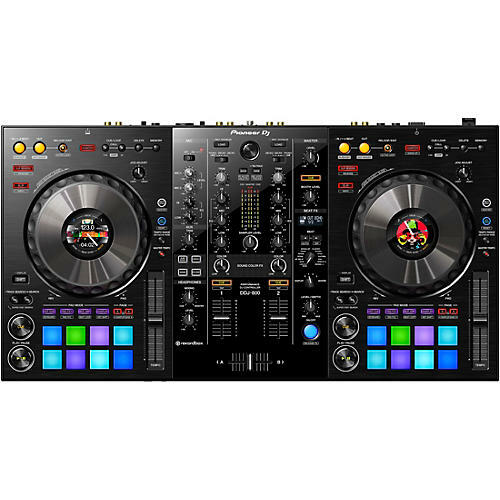 With a traditional club-style layout, the DDJ-800’s controls are exactly where you’d expect them to be. The integrated 2-channel mixer includes smooth level sliders and crossfader. Dial in the perfect amount of crossfader resistance with Feeling Adjust, and let the scratching and cutting begin. Just like you’d find on Pioneer’s professional club mixers, this mixer boasts Sound Color FX and Beat FX. Three-band EQ on each channel lets you dial in the perfect sound. No all-in-one DJ controller would be complete without performance pads. The DDJ-800 features eight tactile, RGB-illuminated pads on each deck. With these 16 pads you can trigger cue points and onboard effects such as Pad FX, Beat Jump, Sampler and Keyboard Mode. Express your creativity in ways you never imagined before. Give your DJ sets your own personal style. The Pioneer DDJ-800 is rekordbox dvs-ready, right out of the box. You can easily connect external turntables or media players to control rekordbox dj to give you a 4-deck setup. If you don’t use rekordbox dj, you can still use this controller to play your favorite music stored on a USB stick. This portable controller is all about flexibility and versatility.